What Are the Health Benefits of Eating Bone Marrow? Bone marrow, the soft mushy stuff inside bone, is considered a delicacy in many kinds of cuisine. It contains a high percentage of fat -- about 96 percent -- but also many beneficial qualities, leading to potential health benefits. These include building immunity, repairing wounds, helping with digestion and even fighting cancer. 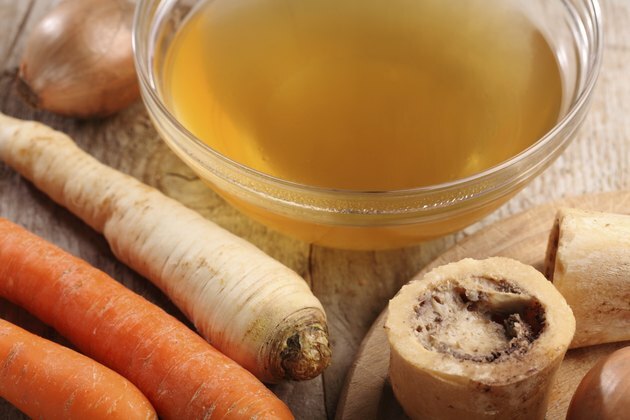 Bone marrow, in broth or in other forms, is a global wellness tool. Dr. Daniel Auer, a certified clinical nutritionist, says almost every culture claims some form of bone-based concoction. The Chinese use bone to support kidney and digestive function and to build blood. The Weston A. Price Foundation reports another example from a North Carolina mountain Indian population. Their diets rely heavily on wild game, and they value marrow to nourish their growing children. Cindy Micleu, instructor at the Jade Institute complementary healing center, says bone marrow contains myeloid and lymphoid stem cells. The foundations for red and white blood cells, these cells build immunity, assist with blood clotting and help provide oxygen to cells. Collagen, the protein-rich substance that cooks down to gelatin, can also help repair the body. Collagen deficiency can lead to poor wound healing, easy bruising and bleeding gums. Collagen in bone marrow can help the body rebuild itself, says Micleu. Dr. Astrid Brohult, a Swedish oncologist, administered calves' marrow to leukemia-stricken children in the 1950s, hoping it would replenish white blood cells destroyed by radiation therapy. After administering the marrow, some of the children improved immediately; many experienced increased energy and white blood cell normalization. After conducting a decade of research on the subject, she isolated a group of compounds called alkylglycerols (AKGs) in the calves' marrow and discovered they were responsible for normalizing the white blood cell production.